It was all Q’s idea. Lately Q has been reading the Cupcake Diaries books, a series of stories about a set of middle-school girls (the Cupcake Club) learning to navigate increasingly complex friendships, and on the way coming to themselves. 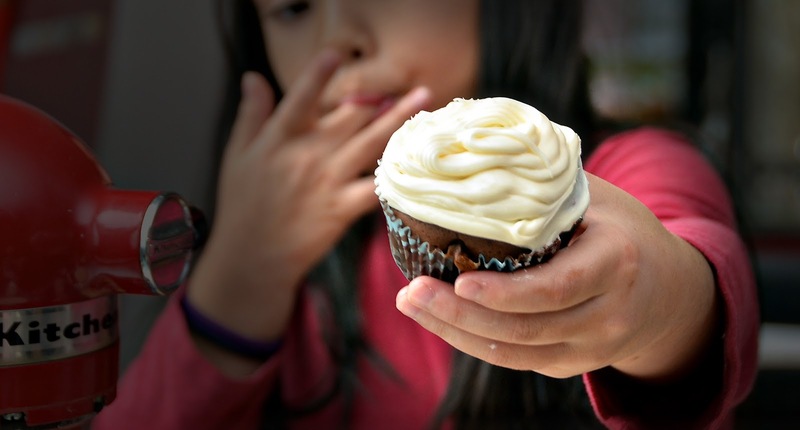 Most books involve the Cupcake Club baking for some special event, and when my lovely wife and I talked with Q and The Boy about how hurricane Sandy left so many lives in our area so precarious, Q suggested that we have a bake sale to raise money to help out. She could invite some friends over to help her make cupcakes and sell them in the lobby of our building. Great idea, we said. The Boy was on board right away, too, and offered to help with everything. 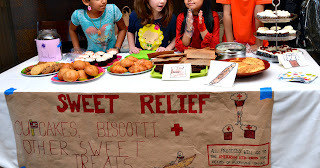 Q asked her mom to contribute her signature (super-labor-intensive) apple-ginger biscotti, and she, of course, agreed. In working out a time for girls to come over for cupcake baking, several moms volunteered to bring sweets to sell and lent us pans to increase production. We were in business. Baking day, we set out the pans and the ingredients for them (eggs that they each could crack), the sparkly bottles of sprinkles, and the cupcake liners with the classy pattern. Q taught her friends how to neatly pipe on the frosting using the equipment she received as a gift from her aunt who loves to bake and decorate. The girls made huge fun out of it all, along with some cupcakes, a few of which they ate themselves. As expected, Q’s mom eventually finished up after the girls, who couldn’t resist being seven-year-olds any longer, laughed their way into Q’s room to play. The sale went even better than expected. Our building always supports these kinds of activities: The building manager sent out an email about the fundraiser to all residents, and he lent us one of the building’s tables and tablecloths. Everyone contributed. One of the moms brought crazy amounts of cookies and brownies and cupcakes, which the girls sorted and arranged (and resorted and rearranged) shop-like on platters and plates. The Boy handled the money and the promotion — “I highly recommend the biscotti,” he’d say as people approached. The table of kids made customers of most residents, many of whom paid way more than they needed to. Some of the kids’ friends came by with their own wallets and purses. After a couple of hours the inventory dwindled, as did the young girls’ attention. Q and her friends took a break to play at house, which I thought fitting given that they were raising money to help those who had lost theirs. The Boy stayed at the table through the end, including sweeping up with an older sister of one of Q’s friends, once we called the sale. Altogether they raised around $500. That morning we learned that a person who works in our building and who has helped us out many times lost his house and car in the flood. We decided to donate some of the money to his family and to let the rest be doubled by the company my wife works for. As far as stories go, this really isn’t a very good one. It has nothing going for it apart from its truth: Q had a great idea, pure in its kindness and intent, and we executed it with selfless help and without surprise or drama. We confirmed the generosity of our friends and neighborhood, something that was not in question. Q gave no particular indication of dedicating her life to service from here on out; we saw no real transformations of any kind, in fact, which every good story requires. If anything, this post amounts to an extended expression of pride in Q and The Boy and — and, well, ourselves. Such things are usually, and totally, annoying. We try, as all parents do, to encourage our kids to value the valuable and to find ways of releasing the unimportant’s grip on them. We struggle with this ourselves, always will, in no small part because the valuable does not often reveal itself. And when it does — as when so many lose so much of their lives so visibly and suddenly — the sense of duty accompanying it can paralyze and crush. It becomes easy to sympathize with Alvie Singer in Annie Hall, who says, “I can’t enjoy anything unless everyone is. If one guy is starving someplace, that puts a crimp in my evening.” New York and New Jersey were hit very hard by hurricane Sandy, sure, but Haiti was devastated. Why not another sale for them? Or for the street kids in Brazil who need no hurricane to have need, or the displaced in Afghanistan or Syria or Sudan or so many other places, or the homeless and forgotten in our own city? No amount of baking seems enough. But here comes the story: Q and The Boy themselves came up with a way to help and made it happen. And they enjoyed themselves while doing it. They began to find, in a cupcake, a way to something larger than themselves, though even now no part of us can contain them. Every time you or your wife post about the way New Yorkers are helping victims, I smile. You live in a beautiful nation. And this story is even more beautiful. It was their idea, but it's you & your wife who raised them and helped them grow into who they are. You all rock! !